Antisthenes (c. 444 - 365 B.C.E. ), is one of the founders of the Cynic School of philosophy. 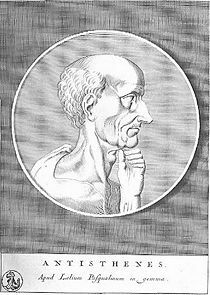 In his youth he studied rhetoric under Gorgias, perhaps also under Hippias and Prodicus. He became a devoted pupil and close friend of Socrates, walking forty furlongs daily from Peiraeus to Athens to hear him speak. Eventually he encouraged all of his own pupils to study under Socrates. Antisthenes founded a school of his own in the Cynosarges. Emphasizing an ascetic life and the cultivation of wisdom, he donned a ragged cloak and carried a staff and a wallet, items that later became symbols of the Cynics. His basic teaching was that virtue is sufficient for happiness. One of his followers was Diogenes of Sinope, who further developed the Cynic school. Antisthenes was among those present at the death of Socrates. Antisthenes was born in Athens in 445 or 446 B.C.E. Most of our knowledge of his life comes from Diogenes Laertes’ Lives of Eminent Philosophers, and from the dialogues of Xenophon. His father, also Antisthenes, was an Athenian and his mother was a Thracian. Because their marriage was considered illegal, Antisthenes was not an Athenian citizen. Diogenes Laertes mentions several remarks made by Antisthenes regarding his status as a non-citizen. On one occasion, when he was reproached for not being the son of two free citizens, he replied, "And I am not the son of two people skilled in wrestling; nevertheless, I am a skillful wrestler." He began his studies under the rhetorician Gorgias. His only surviving works, Ajax and Odysseus, both demonstrate this rhetorical training. After meeting Socrates, he gave up his rhetorical training and began to study philosophy, encouraging all of his students to do the same. According to Xenophon’s dialogues, Antisthenes was a close friend and associate of Socrates. Diogenes Laertes recounts numerous anecdotes about Antisthenes’ sharp sense of humor and his ascetic lifestyle. He is credited with being the first to double his cloak in order to sleep in it, and carried the staff and wallet, which later became the uniform of the Cynics. On one occasion, when he turned a tear in his cloak to the outside, Socrates chided him, "I see your pride looking out through the rent of your cloak, O Antisthenes." He used sarcasm as a means of undermining the traditional Athenian values and institutions. Antisthenes is credited with writing at least sixty works, only fragments of which remain. The earlier writings reflected his rhetorical training under Gorgias; the later, on topics such as virtue, good, law, morality, strength, and marriage, deal mostly with ethics. Socrates taught that it was a moral obligation to obey civil law. Antisthenes placed obedience to moral law and ethics above civil law. He believed that a society should be ruled by wise men and did not like the Athenian democracy of the time. Diogenes Laertes relates that he used to advise the Athenians to pass a vote that asses were horses, and when they thought that irrational, he said, "Why, those whom you make generals have never learnt to be really generals, they have only been voted such." (When the Athenian democracy was temporarily overthrown by the Thirty Tyrants, he had even less respect for their rule.) This disregard for civil law in favor of moral law was further developed by the Cynics Diogenes of Sinope and Crates. Antisthenes also disregarded public esteem and praise, considering them detrimental to the development of virtue. When told that Plato had criticized him, Antisthenes is quoted as saying, "It is a royal privilege to do well, and to be evil spoken of." This statement became a precept of the Roman Stoics and was quoted by Marcus Aurelius (121 – 180 C.E.) in his Reflections. "Wisdom is a most sure stronghold which never crumbles away nor is betrayed. Walls of defense must be constructed in our own impregnable reasonings." "It is better to fight with a few good men against all the wicked, than with many wicked men against a few good men." "To the wise man, nothing is strange and nothing remote." "The virtuous man is worthy to be loved." "One must prepare one's self a fortress in one's own impregnable thoughts." Chappuis, Charles. 1854. Antisthène. Paris. Diogenes Laertius. 1979. Lives of Eminent Philosophers Vol. I-II. Trans. R. D. Hicks. Cambridge: Harvard University Press. Dudley, D. R. 1937. A History of Cynicism from Diogenes to the 6th Century C.E. Cambridge: Cambridge University Press. Gomperz, T. Greek Thinkers (Eng. transl. 1905), vol. ii. pp. 142 ff., 150 ff. Muller, A. 1860. De Antisthenis cynici vita et scriptis. Dresden. This page was last modified on 6 April 2016, at 19:41.